The winning t-shirt design by Saffron Buscemi ’22 for the student celebration We Are the World. 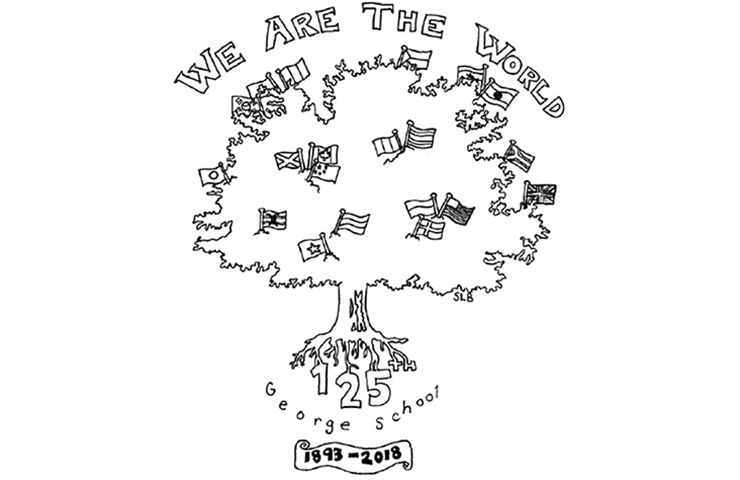 The t-shirts will be distributed the night of the event on October 20, 2018 when George School will be celebrating its 125th anniversary. Students will have the opportunity to celebrate George School’s 125th anniversary with their own event We Are the World in Marshall on Saturday, October 20 from 7:00 to 10:30 p.m. At the same time, parents, alumni, faculty, and staff over the age of twenty-one are invited to Embrace the World, a dinner, dance, and auction happening in the Fitness and Athletics Center. Both events will coincide with Parents Weekend. The student celebration will consist of a glow dance and an international food truck festival. George School thanks the Parents Association, current trustee Betsy Cotton p ’16, and Rob Mulcahy p ’16 for their sponsorships and support of an event that will be a memorable experience for students as the community celebrates a milestone anniversary. Food trucks will be serving up a variety of food and dessert options for students to enjoy. Nina’s Waffles will have Belgian liege waffles and ice cream; the Little Sicilian truck will be serving Italian arancini, fried rice balls often served with cheeses and sauces; and Mojo Loco will be serving authentic Mexican street food with a wide variety of tacos, empanadas, and quesadillas. We Are the World will also feature plenty of fun activities for students to enjoy such as dance-offs, limbo competitions, a half-court shot, and glow paint. Students will be able to win prizes including Bettye’s bucks, Giant gift cards, Amazon gift cards, and more. Students were encouraged to participate in a t-shirt design contest leading up to the event. Saffron Buscemi ’22 was the winner, and is thrilled to share her design with the community. “When I was making the design, I was really focused on using every element of the George School Katsura tree to represent life at GS and what we stand for. I’m excited to share the artwork I did with the entire GS community,” said Saffron. The t-shirts will be distributed the night of the event, and glow markers will also be available for students to further decorate the t-shirts.